The makeshift stages in Penang for performances are usually tied to religious events. Penang, being a religious lot, has a lot of celebrations each year that will require the set-up of tents with altars for various deities. The most common celebrations will be the birthday of the local earth deity, Tua Pek Kong, the Hungry Ghost Festival and the Nine Emperor Gods Festival. Except for the Nine Emperor Gods Festival, most all other festivals will have performance troupes singing during the night. In the past, the performances are usually done by Chinese Opera troupes dressed in their best regalia and painted faces. There will be rows of chairs placed in front of the stage, and strangely enough the first row is often vacated especially during the Hungry Ghost Festival. It is said that the first row is reserved for the 'good brothers' or rather, wandering spirits, to sit and watch the show. The Chinese Opera performances are done mostly because it is said that the deities and the 'good brothers' are from that era, and they enjoy watching these performances, the major theatrical performance in olden days China before the start of the modern singers era. As the years go by, there are lesser and lesser people learning how to perform Chinese Opera. As a result, the Chinese Opera troupe is scarce and offers performances at a more expensive fee. Eventually, the residents and organizing committee of the festivals and celebrations need to look for alternatives. The alternative available is the growing group of singers, performing modern day pop songs that top the charts in Hong Kong and Taiwan. The performances are by scantily dressed females, and there are male singers too. For the elderly, this is a form of disrespect to the deities and gods, however, the new generation now may have forgotten the main purposes of the performances. To them, the performances are no longer meant for the entertainment of the deities. Instead, it has become a gateway for the young performers to hold their concerts on stage, singers who may not have the privilege to be noticed by any recording companies to display their talents and earn some additional income during the few days of singing. However, not all are unknown singers. Some of Malaysia's local singers too, may take this opportunity to perform on such dates, as long as the price is right. But then again, such a practice is getting lesser, as the new group of singers and performers not wanting to take up such tasks and instead concentrate on their career based on arrangements by the recording and production houses, usually excluding such assignments. What do the deities want? There are a lot of different views, mostly based on the personal opinions. Some go as far as to say that the times have changed, that even the ghosts and deities of the underworld are interested in scantily dressed females. However, is this what the deities want? Interviews with the various masters will agree that deities and gods do not have a preference for such modern performances. However, the masters do not speak about it, and according to the mediums, the deities will just ignore the performances. Times have changed, and it will be difficult to demand for the traditional Chinese Opera if the people are not able to afford it, or if there is a scarcity of talents. For those who still have Chinese Opera troupes performing to the deities, special prayers must be done in front of the altar to seek the blessings of the deities for the performance, especially for the Hungry Ghost Festival. 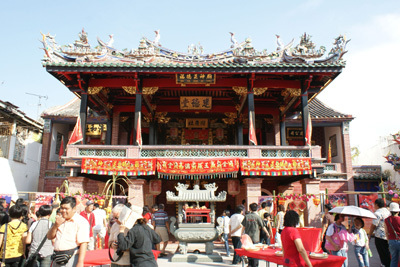 During this time, the troupe leader will bring his team of actors and actresses to pray to the Da Shi Ye, seeking permission to perform and for the protection of the operatic troupe against mischievous spirits from any form of pranks or harm. There is a doll that represents the troupe, to be placed at the altar for the prayers until the end of the performance. Meanwhile, for those performance troupes with modern singers, prayers are performed with the singers offering joss sticks and joss papers before the altar to ask for a smooth performance too. It is said that performance during the Hungry Ghost Festival can be infused with unexpected events caused by mischievous wandering spirits. The Penang state government is sponsoring some of these events with the hope to preserve the original culture, and for a peaceful year ahead. This entry was posted in Tourism & Leisure and tagged Chinese opera, George Town, Georgetown, Hungry Ghost Festival, Makeshift Performance, Makeshift Performances, Penang by admin. Bookmark the permalink.